Time and mortality are the ostensible subjects of this three-person show featuring Mary Hull Webster, Ilene Segalove and Margo Majewska. 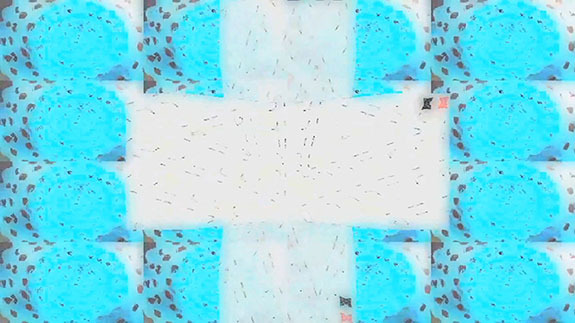 The highlight, Webster’s 3-screen projection, Hidden Narratives, is anchored by two videos composed of shifting grids in which marks and shapes dissolve into one another kaleidoscopically. They contain no “narrative” per se, but they do have a distinct emotional arc. It's shaped by sampled sounds that, when synched to the rhythms of the visuals, add up to a compelling “portrait” of how sensation registers subconsciously or in an emerging state of consciousness such as a newborn’s. Running simultaneously on adjacent monitors is a third segment called The Last Journey of a Very Old Man. It assumes the view of a dying man looking at a city as if in a film or from the window of a moving vehicle. Different as they are, these visions complement each other in that they bookend the life cycle. The first two — elastic, dream-like and in color – can be taken to represent the seemingly endless possibilities of youth. The third, mostly in black and white, and with captions running across the bottom, gives off the feel of an hourglass being emptied, of possibilities being foreclosed. Ilene Segalove, Whatever Happened to My Future? Segalove, in her video, Whatever Happened to My Future?, approaches the subject as Woody Allen might: as a comic/existential dialog between her now 50-something self and her teenage self. 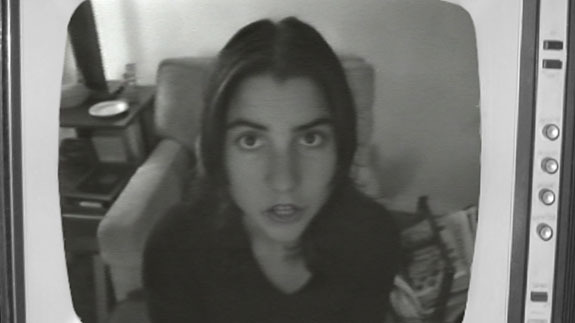 She does it by inserting lip-synched questions into actual footage of herself as a teenager, alternating those clips with color footage of her current self responding to questions posed by her younger self. It’s a well-worn conceit, the most famous example being Joyce Maynard’s imaginary letter to her future self, published in The New York Times in 1972 when the writer was an 18-year-old college dropout, on the verge of commencing an affair with the 53-year-old J.D. Salinger. In Segalove’s version of it there’s an interesting twist. About two thirds of the way through the roles reverse; instead of age telling youth how to view life’s mysteries, youth, observing age’s inevitable cave-ins and cop-outs, tells age to buck up and get a grip. The hackneyed dialog hardly matters; what does matter is how the artist uses dueling videos to create the credible illusion of an impossible conversation happening in real-time. 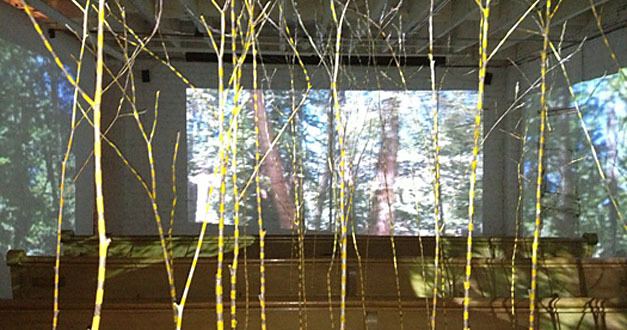 Majewska’s projection of forest scenes (Sky Meadow Road) onto three walls of the gallery’s “Pew Room” sets the stage for an intrigue that never quite materializes. If her purpose to create a soothing indoor environment that simulates a forest, fine. Still, the question that remains is: Why synthesize an experience when the real thing is close at hand? “Digital Madeleine, or Video-Time Is Never Lost or Past. Three Solo Presentations: Margo Majewska, Ilene Segalove, Mary Hull Webster” @ Krowswork through October 11, 2013.